When I first watched the movie Fight Club I was intrigued that the characters were able to make soap (and other more…um…explosive substances) so easily with just a few simple ingredients. To me, soap was something to add to the shopping list, not something that I had ever considered making myself. And even after Fight Club, I still didn’t, seeing the searing burn on Edward Norton’s hand was enough to convince me that soap making was something best left to the professionals! In spite of this, my interest in making soap and other skincare products was awakened recently when considering our plastic usage – I began to research soap making as a way to reduce our plastic use from purchasing shower gel and so on. I was amazed by the variety of beautiful soaps that soap hobbyists have made, and also the simplicity of ingredients needed. And, I have to admit, although chemistry was never my strong point, the sciency-ness of soap making appeals to me too! As a first foray into soap making, I decided to purchase a kit to get me started. I have been following the blog of Gavin Webber (www.greeningofgavin.com) for a while now – in fact it was his blog that inspired me to finally get off my bum and start writing – and they now run soap making workshops and sell supplies online. I liked the idea of supporting a local small business run by people with the same goals as us so I ordered an Orange Blossom Scrub Soap kit from their online shop (www.littlegreenworkshops.com.au). Sounds lovely! The kit arrived really quickly within a couple of days, and contained all of the oils needed, some exfoliating poppy seeds, orange blossom fragrance, orange colour and the soap mould, plus step-by-step instructions. Over the weekend David and I decided to bite the bullet and have a go! The only additional things you need are sodium hydroxide (lye, a.k.a. caustic soda) and water – we used distilled water from the local hardware shop. We also bought a craft thermometer, and some heavy duty black gloves – Sodium Hydroxide is a strong alkali and can cause nasty Fight Club-esque burns. Combined with my lovely cow-print apron and some safety glasses I was ready to go! First I prepared the wooden mould ready for the soap by lining it with greaseproof paper – I found some instructions on www.soapqueen.com on how to do this neatly. We then warmed the oils (Rice bran oil, sunflower oil, coconut oil and olive oil) to about 50-60°C in a metal bowl over hot water on the stove to avoid overheating or burning the oils themselves. It’s winter here in Melbourne and the coconut oil had solidified inside the bottle – we melted it by immersed the bottle in hot water for about 30 mins then poured it in with the other oils. Next we prepared the lye. I have to admit I was worried about this step, even though I use Sodium hydroxide in the lab at work and should be familiar with it! We weighed out our distilled water and carefully added the sodium hydroxide, keeping it under the cooker extractor hood to draw away any fumes. Once the sodium hydroxide had dissolved and cooled a little, we carefully poured it into the warm oils and began mixing. We didn’t have a spare stick blender so used one of those mixers with beaters at a slow speed, which worked fine although our bowl wasn’t quite deep enough so we had to be very careful to avoid splashes. After a few minutes of mixing it began to thicken until it reached ‘trace’ where we could dribble a bit of mixture onto the surface and it would stay there for a few seconds. 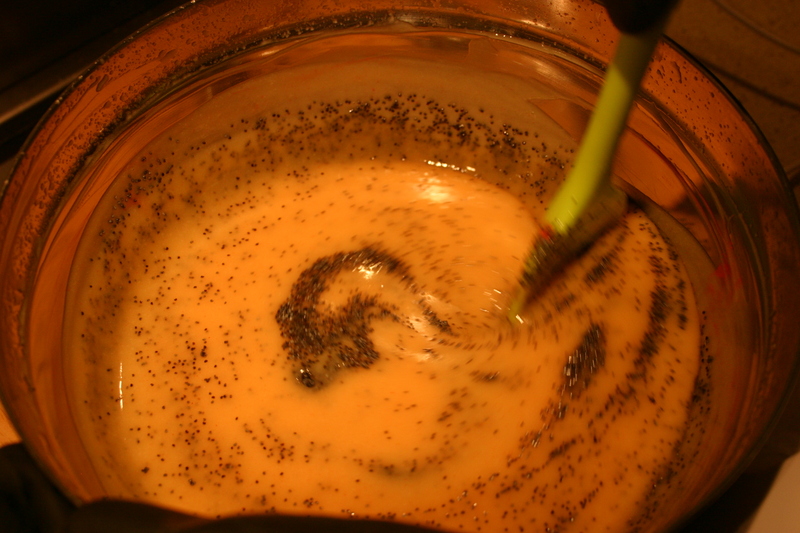 At this point we mixed in the poppy seeds, the orange blossom fragrance (which smelled delicious!) and some orange colour. We poured the soap into the prepared mould, covered it with a lid made from greaseproof- paper coated-cardboard, and then insulated it by wrapping it in a few big towels. Then we waited. Two days later and it was time to unmould the soap to see how it looked. I was so excited! After carefully unwrapping the towels, I tentatively prodded the top of the soap with a gloved finger. It had solidified, so far so good. Unmoulding the soap was a little tricky – it was quite snugly tucked in and didn’t want to budge, plus I was cautious about squishing it as I’d read it was still quite soft at this stage. After some gentle pressing with the flat of my hand on the top, I was able to finally wiggle the sides of the mould up to release the big soap bar onto the worktop. Success! I peeled off the greaseproof paper, which had stuck quite well in places but as the soap was still soft it wasn’t too hard to carefully get under and edge and peel the paper off. This is how it looked all unwrapped. I cut it into 11 individual bars, which should be enough to keep us going for a good long while! They need to cure for about 4-6 weeks before they’re ready to use, so we’ll have to be patient a while longer before we can test them, but they look kind of … well… soapy… and they smell lovely! You can see in this picture that the colour has changed a bit along the edges of the bar, nearest where it was touching the sides of the mould. I’m not sure whether this is due to these parts cooling a bit quicker than the middle, or whether they had reacted a bit differently where they were in contact with the paper or something? Either way it doesn’t bother me, as a first attempt at soapmaking I’m pretty pleased! The Little Green Workshops kit was a great non-scary way to get involved with soap making – I’m excited to try more now, and have been reading up on more recipe ideas and collecting ones I’d like to try, so watch this space for more sudsy adventures! This entry was posted in soap, sustainable living and tagged soap, sustainable living. Bookmark the permalink. 1 Response to Bubble bubble toil and trouble!